Work has started on the Aurora bridge fence project. 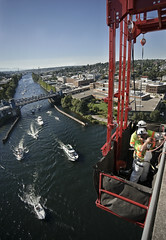 This entry was posted on Monday, August 16, 2010 at 8:18 AM and is filed under aurora bridge, photos, suicide fence. You can follow any responses to this entry through the RSS 2.0. You can leave a response.